The 2013 Atlantic Hurricane season will go down in the books as being free of hurricanes through August. However, data suggests that interests in the basin may not be so fortunate through November. 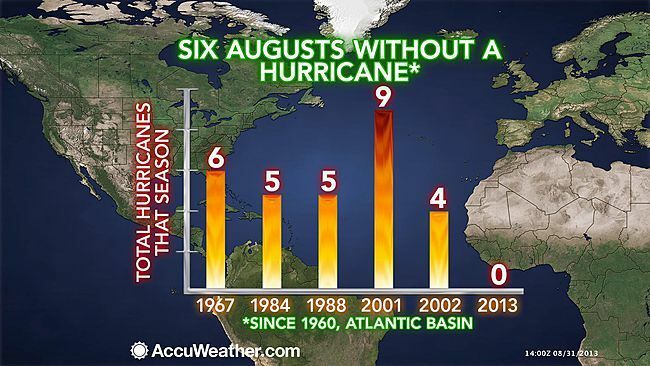 According to Meteorologist Adrienne Green, "Since 1960, there have been five years when there were no hurricanes through August." The years were 1967, 1984, 1988, 2001 and 2002. At the close of Saturday, 2013 will officially join this list. "During each of those [five years before 2013], multiple hurricanes followed spanning September through October," Green said.